The possibilities are endless for Hartford Wedding Photography with so many gorgeous venues located in and around the city. Some the best venues for Hartford Wedding Photography are the Society Room of Hartford, the Hartford Club, Marquee Events & Catering featuring the Gershon Fox Ballroom, the Bushnell Center for the Performing Arts, the Connecticut Convention Center, Ann Howard at the Bond, and the Riverfront Boathouse. This couple chose to have their wedding at the Baltic Restaurant, located in the heart of the city. For over 19 years, the Baltic has been serving the area of Central Connecticut delicious Polish-American cuisine that is inspired by the heritage of the restaurant’s founders. The Baltic is a wonderful place for any event, with the space the owners call the Kensington Palace, which can accommodate up to 220 guests. The room is known for its elegant atmosphere and spacious dance floor, perfect for Connecticut wedding receptions. In this image of the reception space, crystal chandeliers hang above the guests, illuminating an already bright evening. The couple has just cut the wedding cake and the bride is in the process of smashing a piece in the face of her husband. The picture captures the fun-loving, carefree nature of the newlywed’s relationship as guests look on in love and amusement. The bride’s gown is beautiful with a sweetheart top and chiffon fabric. Her hair is swept back in an elegant updo, with diamonds sparkling at her ears. The groom wears a white dress shirt, white tie, contrasted with a black tuxedo vest, with black cuff links. Luckily for him the icing is also white, just in case things get messier. 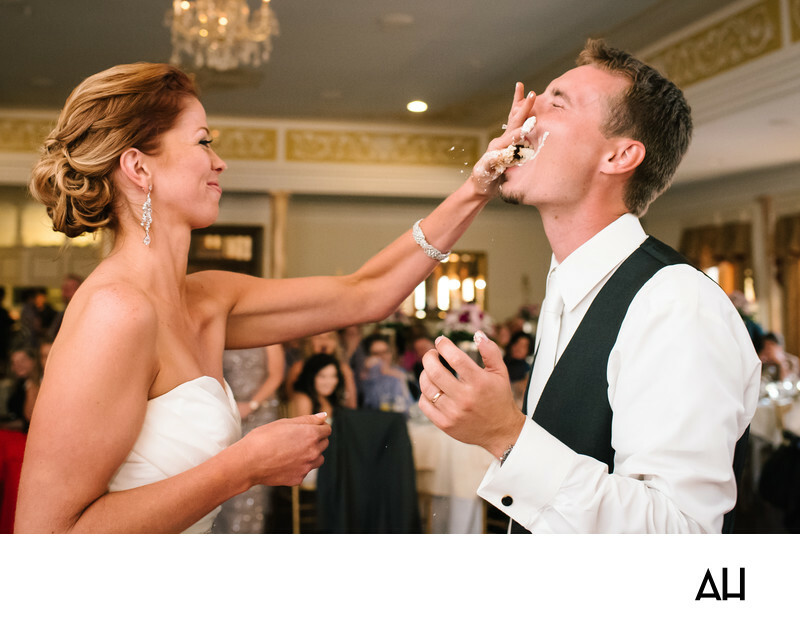 The bride’s expression in this moment is playful and a bit mischievous, and the groom laughs through a mouthful of cake.